Low chloride grade. 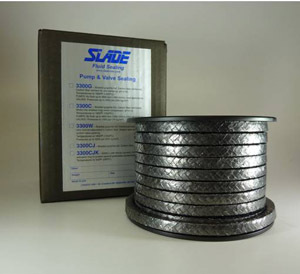 Slade’s Cost Effective Pump & Valve Packing for higher pressures. Each individual strand of graphite foil is reinforced with Inconel® wire that is shrouded with high strength carbon fiber. Two independent tests (PERF standards) by Major Oil Company show emission control 3.9 and 6.4 times better that (1/5 stac) die formed rings of flexible graphite foil.